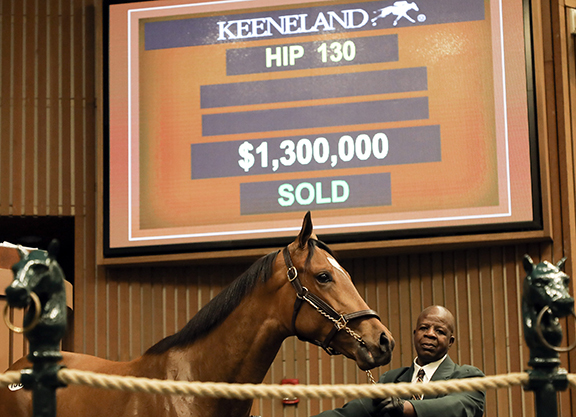 LEXINGTON, KY – The Keeneland April 2-Year-Olds in Training Sale returned from a four-year hiatus Tuesday in Lexington and a filly by leading sire Tapit provided the fireworks when selling for $1.3 million. The filly (hip 130) was consigned by Hartley/De Renzo Thoroughbreds and was purchased by bloodstock agent Chad Schumer on behalf of Prince Sultan bin Mishal Al Saud, who continued to be a new and active participant at the spring’s 2-year-old sales. The April sale began with a section of horses of racing age and the graded stakes placed 3-year-old filly Sweet Diane (Will Take Charge) was the section’s highest-priced offering when selling for $500,000 to Ina Bond’s River Bend Farm. Through both portions of the sale, 67 head sold for $6,083,500. The average was $90,799 and the median was $40,000. In all, 22 juveniles sold for a total of $3,387,500. The average was $153,977 and the median was $55,000. With 39 2-year-olds going through the ring, 17 failed to find new homes. At its last edition in 2014, 38 juveniles sold for $8,769,000 for an average of $230,763 and a median of $200,000. Schumer looked at Tuesday’s results as something to build on going forward. Dean De Renzo appreciated the extra time the April sale provided he and Randy Hartley to prepare the sale-topper. Saudi Arabia’s Prince Sultan Bin Mishal Al Saud, who burst onto the juvenile sales scene as a major buyer at last month’s OBS March sale, continued to play at the top end when spending a sale-topping $1.3 million to acquire a daughter of Tapit (hip 130) Tuesday at Keeneland. Emmanuel de Seroux’s Narvick International signed for the prince’s eight purchases at OBS, but it was bloodstock agent Chad Schumer signing the ticket at Keeneland. Consigned by Hartley/DeRenzo Thoroughbreds, the bay filly is out of Grade I winner My Conquestadory (Artie Schiller). Her 3-year-old full-brother Bourbon War is on the GI Kentucky Derby trail and co-owners Bourbon Lane Stable watched intently as the filly sold Tuesday. “She is by one of the leading sires of all time, it’s a massive pedigree. So it’s not an unexpected number,” Schumer said of the final price. Prince Sultan Bin Mishal Al Saud’s eight purchases at OBS were led by a $650,000 daughter of Speightstown. The last time Keeneland hosted an April sale in 2014, Schumer came home with a more modestly priced juvenile and future graded stakes winner in Saham (Lemon Drop Kid). While Chris Baccari typically enjoys his pinhook successes at the Keeneland September Yearling Sale with horses acquired as weanlings, he made a nice score Tuesday with sale-topping hip 130. He acquired the $1.3-million Tapit filly for $775,000 as a Keeneland November weanling in 2017. Given the buzz the Hartley/De Renzo-consigned miss had garnered after her :10 flat breeze, Baccari said he wasn’t surprised by what hip 130 brought. “With the kind of pedigree she has–she goes :10 flat, she goes :20 1/5 and :32 2/5, and she looks the way she does. That’s why I had to give so much for her as a foal,” he said. Shortly after selling hip 130, Hartley/De Renzo offered hip 142 on Baccari’s behalf, but the :10 1/5 breezer was bought back for $550,000. The daughter of American Pharoah was bred by Baccari’s Seclusive Farm along with Chester and Anne Prince and James Murphy and RNA’d for $385,000 as a KEESEP yearling. Sweet Diane (Will Take Charge), on the GI Kentucky Oaks points board thanks to a third-place finish in the GII Fair Grounds Oaks, will be joining the barn of trainer Eddie Kenneally after selling for $500,000 to Ina Bond’s River Bend Farm. It was the highest price at the horses of racing age section of the Keeneland April Sale Tuesday. The addition of Sweet Diane will double River Bend’s racing stable. The operation currently has Island Song (Speightstown) in training with Kenneally and that 3-year-old gelding was fifth in a maiden special weight at Keeneland Saturday. Sweet Diane (hip 90) is out of stakes-placed Inside Passage (Tiznow), who is a half-sister to Glinda the Good (Hard Spun), dam of champion Good Magic. Rick Kanter’s Stallionaire Enterprises purchased her for $130,000 as a Keeneland September Yearling in 2017. She RNA’d for $95,000 at last year’s OBS April sale. Sweet Diane currently sits 16th on the Kentucky Oaks points board, but Kenneally confirmed the filly would skip the Run for the Lilies. Sweet Diane broke her maiden by 13 3/4 lengths at Penn National last September. She missed by just a neck when second in the Hut Hut S. in December and returned this year with a third-place effort in the Feb. 9 Suncoast S. In her final outing for trainer Mike Stidham and Stallionaire Enterprises, Sweet Diane was third in the Mar. 23 Fair Grounds Oaks (PPs). Stidham admitted it was bittersweet watching Sweet Diane go through the sales ring at Keeneland Tuesday. Sweet Diane was consigned by Elite Sales, which sold eight horses of racing age Tuesday for a total of $1.3 million and an average of $163,750 to lead all consignors at the April sale. Dennis O’Neill landed the Keeneland April Sale’s second-priciest 2-year-old and most-expensive colt when he went to $350,000 to secure a member of Liam’s Map’s first crop as hip 126. Consigned by Ciaran Dunne’s Wavertree Stables, Inc., Agent IV, the grey was a $190,000 KEESEP grand and covered a furlong in a co-fastest :10 flat. The colt, who is out of GSW Jenny’s So Great (Greatness), will head to Dennis O’Neill’s brother Doug O’Neill and will be campaigned by a group that includes Erik Johnson’s ERJ Racing. Johnson had sold sophomore colt Weekly Call (Will Take Charge) for $65,000 through the Elite Sales consignment during the horses of racing age portion of the auction. O’Neill had purchased a pair of Liam’s Map weanlings ($310,000 and $65,000) on behalf of Liam’s Map’s co-owner Vinnie Viola at the 2017 Keeneland November sale. “I’ve talked to Vinnie Viola about him a little bit and I really think he’s got a big, big chance to make it as a sire,” O’Neill said. A winner of the 2015 GI Breeders’ Cup Mile at Keeneland, Liam’s Map was represented by a $400,000 filly at Fasig-Tipton Gulfstream. Fresh off a win in last Saturday’s GI Santa Anita H. with private purchase Gift Box (Curlin), the California-based barn of John Sadler picked up another promising racing prospect in Higher Power (Medaglia d’Oro) Tuesday. Agent David Ingordo did the bidding, and came out on top at $250,000. The well-bred colt was consigned on behalf of his breeder, Josephine Abercrombie’s Pin Oak Stud, by trainer Mike Stidham’s Stidham Racing as hip 83. Higher Power won two of his first three starts before heading into stakes company. He was third in last April’s Northern Spur S. at Oaklawn, and was subsequently transferred from Donnie K. Von Hemel to Stidham. 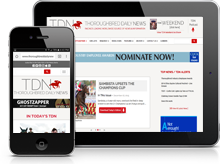 Finishing third twice and fourth once in three Fair Grounds optional claiming tries since the trainer change, he returned to winning ways in a muddy, rained-off heat at Fair Grounds Mar. 16. Click for past performances. Out of MSW and MGSP Alternate (Seattle Slew), Higher Power is a half to MGSW ‘TDN Rising Star’ and young sire Alternation (Distorted Humor) and MSW/GSP ‘Rising Star’ Interrupted (Broken Vow) and hails from the same female family as MGISW and Canadian Horse of the Year Peaks and Valleys (Mt. Livermore). His dam and Interrupted both excelled on the grass.